World Oceans day in Chile 2018 turned out to be a very eclectic mix of public activities for the team this year. After two screenings at Universities were cancelled because of #metoo related strikes, the team had to get creative. Chile, a country that recently adopted a nationwide bag ban, is starting to be aware of the damages single use plastics are generating and is taking action. So what better place to organize a “A Plastic Ocean ” screening, together with the neigbors of Providencia, a Municipality of which the mayor last week declared war on single-use plastic bottles as well?!? The POF Chile team broadcasting on Facebook LIVE. But before the afternoon screening directors Mark and Camila had to first stop by and do a radio interview with Iván Vera at the New Business radio show at “Radio Agricultura 92.1 FM“. They talked about the work Plastic Oceans Foundation does, the true effects of the bag ban, opportunities for innovation and how the Mayor of Providencia is going to reduce the single use plastic bottles in her town. 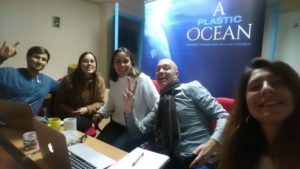 Then the team had to meet up with students Laura and Tomás who are doing their practice with Plastic Oceans, and together they went to present our film in front of a small but motivated crowd of neighbors. The screening was organized in cooperation with the Department of Environment of the Municipality and the Neighbors environmental committee. Barely finishing the introduction of the film the team had to race to the office to broadcast their first Facebook Live Interview with followers in Chile and Latin America. People logged in and started sending in questions, while the team spoke about the Microplastic invasion currently happening in Easter island. Followers asked questions about what to do with plastics products used in hospitals, how to replace plastic garbage bags and when we will be shooting the next documentary. 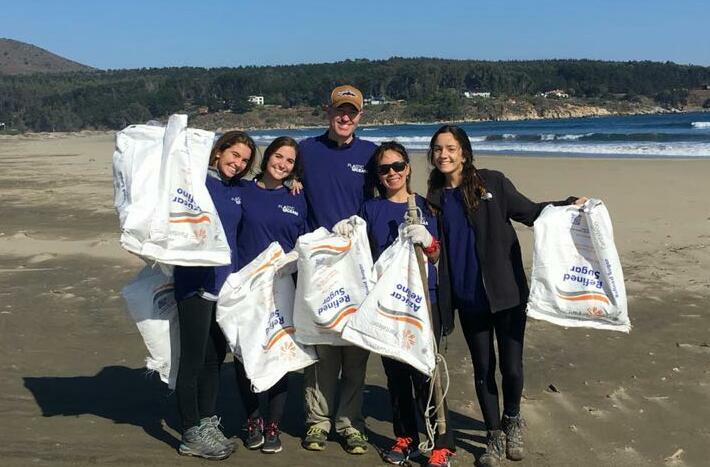 All in all, it was a crazy but rewarding day for Plastic Oceans in Chile.